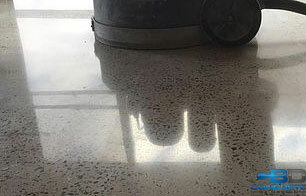 Polished concrete, also known as concrete polish is the process of refurbishing the surface of cement concrete into a tough and glossy finished floor. The process including grinding, strengthening, and then honing the concrete transforms the concrete surface in a long lasting flooring solution. Commercial spaces are utilizing this option for their locations more than ever before. Recent advances in technology have made this a high demand option that is cost effective over the long term. Concrete polishing requires no wax or final coatings, leaving you with a satin or, if you prefer, high gloss concrete floor that demands very little maintenance. This option is increasingly popular for large warehouses, grocery stores, office facilities, retail locations, churches, etc. The downtime for a polished concrete floor is minimal when compared to other, traditional, flooring options. The process involved in polishing concrete is one that requires a high level of knowledge about concrete and it requires heavy duty industrial equipment using diamond blades to gradually grind your concrete surface. There are multiple sizes of diamond bits necessary to hone the surface with each pass of the concrete machines, making it an exact science. 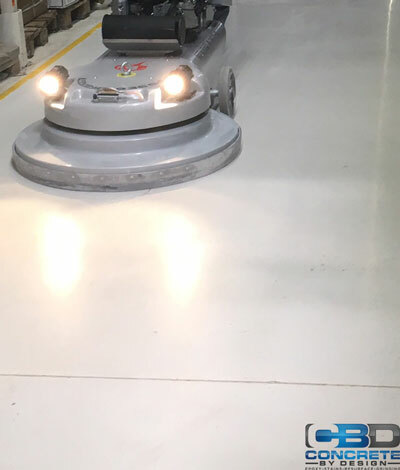 As technology has advanced, so has the performance of these machines, creating surfaces that leave you with superior durability and lasting performance from your concrete investment. 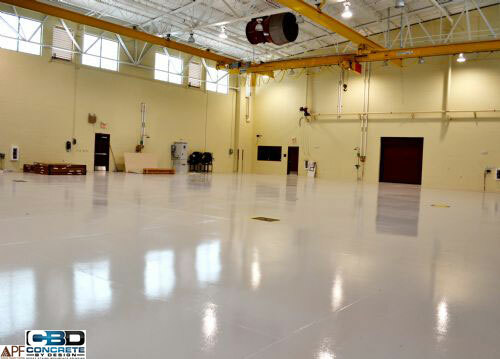 Whether you have an existing surface or a new concrete pour, concrete polishing can be your solution for your business. Often times, if working with an existing surface, a certain amount of preparation will need to be carried out before the polishing begins. Removing dirt, grime, stains, glues, tile, etc, will need to be done in order to begin the process of polishing. If your business requires an extremely dense surface, a penetrating hardener can be added to the concrete in the early stages of the polishing process to solidify and densify your concrete. For a new surface, the only requirement is that the slab be a minimum of 28 days old in order to ensure that is has properly cured. Polishing also offers a solution that is safe for heavy foot traffic when kept clean and dry. Although, with polishing, you can achieve a very high gloss, glassy look, it is less slippery than waxed linoleum or polished marble, making it a great solution for commercial spaces. The amount of care needed for polished concrete floors is minimal in comparison to traditional flooring choices. A simple dust mop on a regular basis and wet mopping is all that is needed to maintain these floors, and the level of traffic in the areas will typically dictate the frequency of dry and wet mopping. Because of the level of expertise that polished concrete requires, we would not recommend this to be a DIY project. If you are interested or have questions concerning your floors and whether this could be the option you are seeking, we welcome your call at (678) 378-5963. Our team of experts can go over any further questions and we are happy to come take a look at your location.